On Saturday, we made a short trip to London with the hope of catching up with a girlfriend of mine. Instead, we were caught in a torrential downpour having to squelch down Kings Rd in wet socks and shoes, Little L flying across the footpath and landed on her knees after being accidentally tripped by a very apologetic passerby and half dragging and half carrying the poor child who was complaining of painful knees (she did pretty well in school sprints and obstacle race the day before) and terrible blisters on both her feet. In the end, I had to cancel my dinner plans which I've been so looking forward to and hurried back home with the bedraggled child in tow. Despite the rather unfortunate events, Little L and I managed to explore and discover the little pockets of Chelsea. My first stop was Petit Bateau. 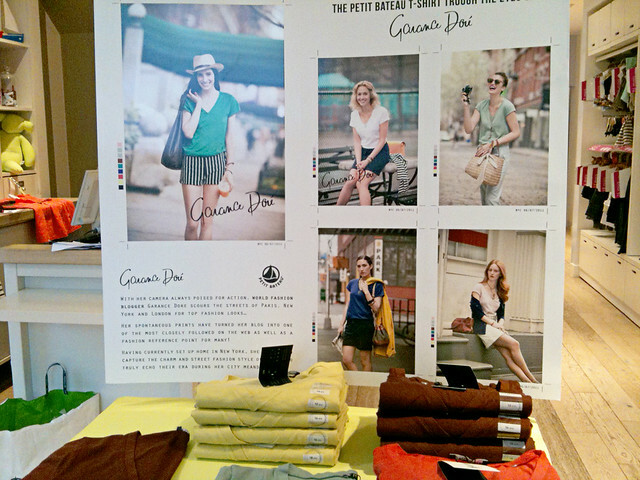 To my surprise, they had a huge cardboard display of photos taken by none other than Garance Dore. She's an insanely awesome photographer and writes the funniest and most candid blog. What a wonderful collaboration! Of course I'm biased since most of my basics come from Petit Bateau and Garance Dore's one of my favorite bloggers. As you know my current obsession with Isabel Marant Dicker boots (and all her jackets but let's not go there for now). I was surprised that Comptoir des Cotonniers has launched a similar looking pair. Check out the photo below but do ignore the droplets of rain. Little L admonished me for taking such a terrible photo but hey, I was wet, cold and hungry. I was too frazzled to go in to check the price. The heels look like they're slightly higher than the Dicker. I had a mission and nothing, even being caught in the rain with a bored little girl in tow was going to stop me from finding The Shop At Bluebird. I kid you not. That is the name of the shop. It is one amazing shop with carefully edited collections from Jason Wu, Isabel Marant, Balenciaga, Rick Owens, Missoni to name a few. They literally have all my holy grails in one spacious shop complete with a spa, salon, furniture, mini bookstore, deli and cafe attached. I guess you could call it your one stop shop. The sales associates are wonderful to deal with. I managed to sneak in a shot (the SA reluctantly agreed but I felt guilty nonetheless). Lauraloo, I'm dragging you here the minute your plane lands in London! I could happily spend half a day here but Little L who has been patiently following me around with nary a complaint was starting to get hunger pangs. You know what they say about hungry kids. They turn rabid in a blink of an eye. Off we went to search for a place where we could rest our weary legs and fill our tummies. I spied a red signboard with the words "Phat Phuc Vietnamese Noodle Bar" right next to a small florist counter on the roadside. I haven't had good Vietnamese or Cambodian food since we left NZ so that'll do. 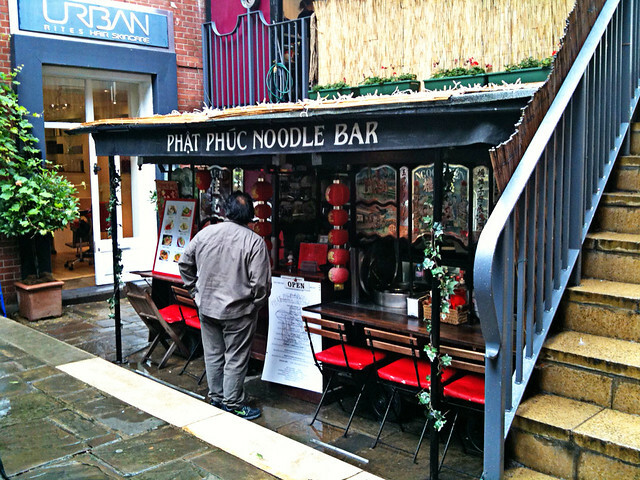 The noodle bar turned out to be this tiny hole in the wall with tables and chairs in the courtyard. 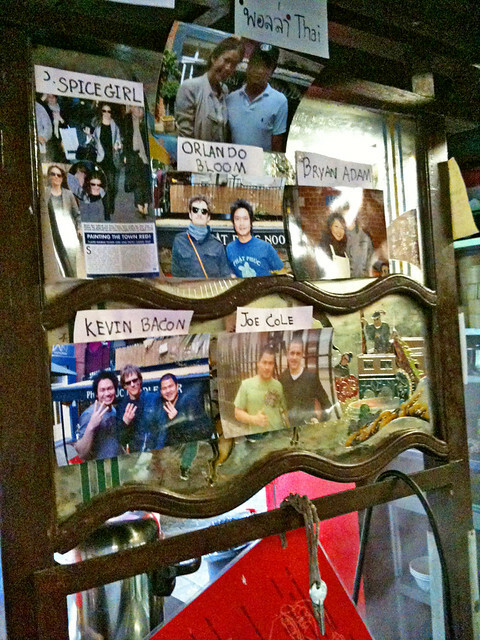 I had my misgivings when I placed my order seeing photos of celebrities who'd eaten there before. Usually it's all hype without any substance if you get my drift. The food turned out to be fantastic and cheap. 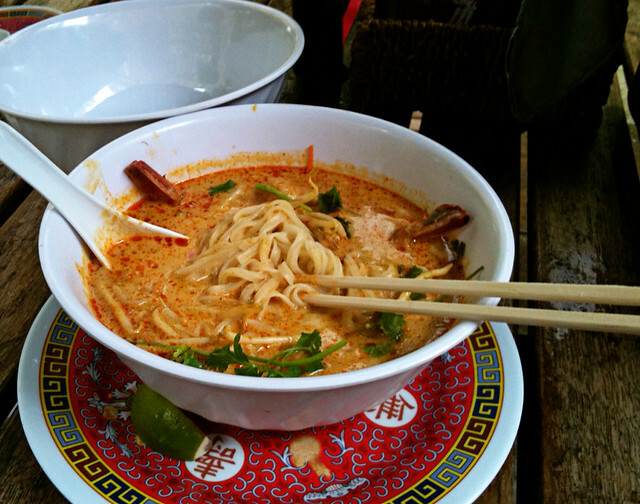 I ordered the Vietnamese version of laksa which I adore. The broth was thick and incredibly tasty with a generous serving of King prawns. Little L scarfed down her roast duck pancake within seconds. 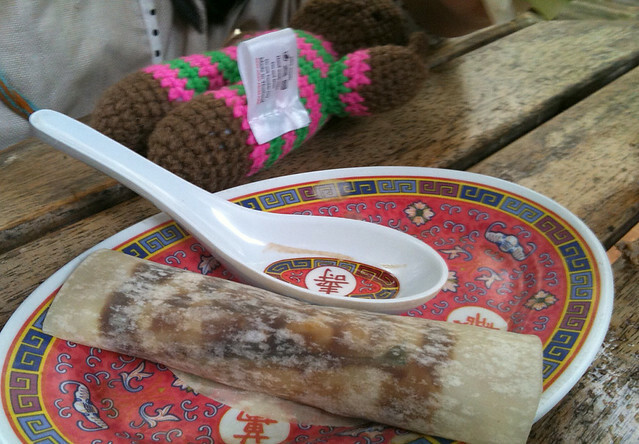 The pancake cost £4 and my laksa was only £6.95. I have a feeling we'll be making plenty more trips to this noodle bar in the very near future. My kid weighs just under 16 kgs. Let's just say she's scrawny but boy, can she pack it in. After we're stuffed to our gills, Little L suggested we look for "pudding". That's dessert to you and I. 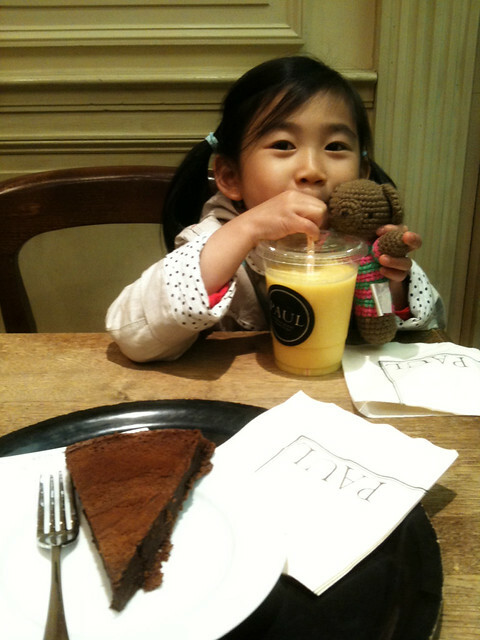 We stopped by Paul for a slice of their delicious but light chocolate cake and washed down with a gigantic glass of passionfruit and mango frappe. I hope you've enjoyed our little adventure in London. See that tall glass of frappe. The entire content vanished into one little girl's tummy. Guess she must have an oversized bladder. I die. Saving my pennies furiously for said shopping trip right after we hit Heathrow! Woohoo! I just about swooned when I fondled the Balenciaga and Rick Owens leather jackets. And the IM dicker boots. You will LOVE this shop! 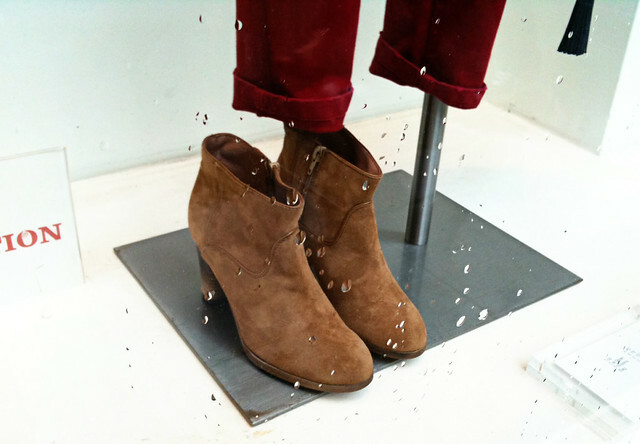 Oooh what a great find the Comptoir des Cotonniers boots!!! What a lovely post! Your daughter is so adorable! Love the Comptoir des Cotonniers boots! MMC & Notes She Wrote, it's actually quite fun to have Litle L with me (well, on good days when she's not whining and whinging). She is rather opinionated so will happily sit in the fitting room announcing her preferences (read: oooh, pretty or Mummy, I think your tummy is too big). Lily & Mona P, I bet they're far cheaper than IM boots.